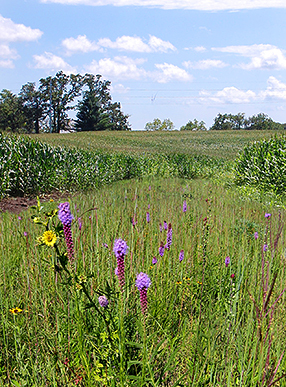 As the Prairie on Farms project develops, a variety of resources will be produced to help rural landowners and technical service providers successfully plant and maintain prairie on working farms. Many of these resources will focus on species diversity: an important key to the establishment of stable, weed-resistant prairie plant communities that will attract pollinators and wildlife. Selecting the appropriate species for a diverse seed mix is one of the first steps in planning a prairie planting. A well-planned mix includes a combination of grasses, sedges and forbs adapted to each site's unique soil, moisture and light conditions. See the Iowa Prairie Seed Calculator for our recommendations for every soil type and Iowa county. • Select species that are native to the region of the planting site. • To ensure their establishment and persistence in the planting, select species that are appropriate to the soil, moisture and light conditions of the site. • All seed mixes should contain grasses, sedges, and forbs (include both legume and non-legume forbs). Plant at least a 50:50 ratio of grass/sedge to forb seed. • All seed mixes should contain annual, biennial, and perennial forbs. Annuals and biennials should not exceed 10 percent of the total forb seed. • Expensive forbs should not be excluded from seed mixes; costs can be controlled by lowering seeding rates. • Seeding calculator programs can automatically calculate the cost of seed for a given area and recalculate seed cost with changes in species selection and seed quantities. • Prairie reconstructions should be planted with a minimum of 40 seeds per square foot. For slopes of 3:1 or greater, 60 to 80 seeds per square foot is recommended because of potential loss due to erosion. • For a dormant planting, increase the seeds per square foot of warm-season grass species by 25 percent (except switchgrass). The seeding rate for forbs need not be changed for a dormant or non-dormant seeding. • Plant seed at the proper depth and ensure good seed to soil contact. If broadcast seeding methods are used, seeding rates should be increased up to 30 percent. • Cover crops are planted to stabilize the soil and reduce weeds when seeding times are inappropriate for seeding natives (from July 1 to Oct 15). • Always include a nurse crop with the native seed to reduce soil loss on erodible sites. Do you have questions about establishing Prairie Strips on commercial farms?